After focusing on starlet Gabrielle Giffords the cameras focus on "Obama's" last state of the union speech before he self detonates as suicide "Obomber" and is stripped of his 44th title after being "exposed" as a criminal (from forging birth certificate to murdering his "granny") and counterfeit president, leading to the proclamation of Hillary Clinton as the "real" 44th president, or in other words the successor of GW Bush. A speech where his second statement is "for the first time in two decades Osama Bin Laden is no more a threat to this country". (2) "Obama" was used to impersonate Osama in his videos of the last years. This "Osama" is Obama, not the original Osama from the seventies. From patsy McVeigh to pure virtual characters, 15 years later in Germany (school masscre) and beyond that, 16 years later in the US and Norway ( not only pure virtual character Loughner but also pure virtual massacres of up to "100" later "68 victims"). Last edited by Administrator; 04-12-2014 at 05:02 PM. Re: ]"Death" of "Amy Winehouse" alias "Lady Gaga"
"Execution" of "Obama" II, alias "Hussein" II (1) of the anti-Bible's Obamanation of Desolation, (after being sentenced to death penalty by Supreme Court) scheduled for --/--/2012 (2) (Genesis 2:2 of anti-Bible). - proving there is no gap in either "Gaga"'s or "Winehouse"'s teeth and how the gap in the teeth was digitally inserted in the videos. But this video that has not yet been removed is more than enough proof by showing how the faces overlap. Ear matching never fails, never. It is considered the same or more accurate than fingerprint. You're another ing moron making asshat claims. Are you really that stupid? You're another f-u-c-king moron making asshat claims. Are you really that stupid? Lets see....we have another f-u-c-king namecaller making asshat claims of resistance, without any substance to support it. Are you really that windy mr windbag? If you say something please state WHY you say so and post some substance to your claim. Feed your brain and make money. Ah yes, this is standard conspiracy practice. When the evidence doesn't agree with the conspiracy, why, then the evidence must be faked ! Thereby proving the conspiracy ! The OP thinks that Barack Obama and Osama Bin Laden are actually the same person. He also thinks that Amy Winehouse and Lady Gaga are the same person. A post that stupid doesn't deserve anything of substance in response. I understand all that and I even agree but that would be my personal opinion. It does not give me the right to start acting like a tool and insulting the poster, unless I feel REALLY strong on the subject or I have something against the poster AND I have hard facts to prove what I say. To say a man is wrong without proving why you say so is bad enough. Too ad to that some namecalling again without saying why one says so,makes one appear like an opinionated tool and not to be taken seriously. Where do you get the idea that Amy Winehouse is Lady Gaga? Stefani Joanne Angelina Germanotta (/ˈstɛfəniː dʒʌrməˈnɑːtə/; born March 28, 1986), known by her stage name Lady Gaga, is an American singer and songwriter. Born and raised in New York City, she primarily studied at the Convent of the Sacred Heart and briefly attended New York University's Tisch School of the Arts before withdrawing to focus on her musical career. She began performing in the rock music scene of Manhattan's Lower East Side, and was signed with Streamline Records by the end of 2007. During her employment as a songwriter for the record company, her vocal abilities captured the attention of recording artist Akon, who signed her to his label Kon Live Distribution. Influenced by David Bowie, Michael Jackson, Madonna and Queen, Lady Gaga is recognized for her flamboyant, diverse and outré contributions to the music industry through her fashion, performances and music videos. She has sold an estimated 23 million albums and 64 million singles worldwide, making her one of the best-selling music artists of all time and her singles are some of the best selling worldwide. Her achievements include five Grammy Awards and 13 MTV Video Music Awards. Lady Gaga has consecutively appeared on Billboard magazine's Artists of the Year (scoring the definitive title in 2010), ranked fourth in VH1's list of 100 Greatest Women in Music, is regularly placed on lists composed by Forbes magazine and was named one of the most influential people in the world by Time magazine. In 2012, Gaga was ranked at number four on Billboard's list of top moneymakers of 2011, grossing more than 25 million dollars. I don't know her even as a celibrity because I don't listen to braindead pop culture stuff. Nice to dance to some of her stuff but that's about where it ends. Sheeple opium. So is there any way I can discern for myself what here real names are other then the mainstream? Research state birth records. It's public information in the U.S. UK... I'm not sure about. Are you actually considering the possibility they are the same person? You gotta be kidding! Public information here in the UK too. You can go and get anybody's birth certificate if you want. Lady Gaga alias Amy Winehouse alias Peaches Geldof dies again. Lady Gaga, Amy Winehouse and Peaches Geldof are all played by the same actress. Lady Gaga, first illuminati pop icon with two staged deaths. 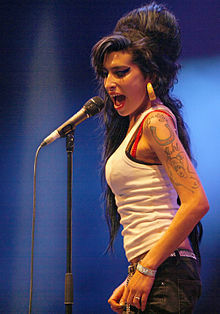 First death as Amy Winehouse, 11 weeks after Osama Bin Laden. Second death as Peaches Geldof 13 days before Osama Bin Laden resurrects on the third year attached to a Boeing 777 from the Indian Ocean, to be immediately after crucified as Obama. - Amy Winehouse and Peaches Geldof share the same drugs dealer in 2008 and share same final words 2011 and 2014. - Peaches Geldolf on Lady Gaga, 2013: "Don't even say the word. People should be asking her about me." "I'm going to need Valium tomorrow after this." She was interviewed by police but not arrested. 19 April 2013 1 The Guardian: If there's one question you don't want me to ask you about Lady Gaga, what is it? "Don't even say the word. People should be asking her about me." Actresses playing Peaches and Pixie Geldof are as much sisters as actress playing Jared Leto and "his" brother (or siblings for that matter) at the very last Oscars, 2014. Actress playing Jared Leto and "his" brother at the very last Oscars, 2014. You live in the Truman world. Although the show is being terminated you refuse to leave the room. After reading this, Ellen Degenerated 's suggestion that Liza Minelli is a travesti will become clear. Jerusalem, Easter Sunday 2014: Carbon Copy of 911 2001: Obama Bin Laden resurrects from an ocean of discrepancies. Treasonous Israeli government, controlled by the illuminati since the coup of 1975, will play its part staging the attack. It wii be staged exactly like 911: while the official story will have "Osama Bin Laden" as perpetrator plenty of "discrepancies" will leave no doubt that it was an inside job. Last edited by Administrator; 04-12-2014 at 05:06 PM. Re: Lady Gaga alias Amy Winehouse alias Peaches Geldof dies again. You're putting out a lot of claims and giving no real evidence, which is fine, standard conspiracy nut business, but not the most crucial part, the why? Aw don't bring Peaches into this! I'm really upset that she passed away :( She seemed like she had really turned her life around. I'm still interested to see what she actually died from. I really hope it was nothing bad because I want to believe that she really loved her kids and her husband. She was so young. It's just such a shame. Aw don't bring Peaches into this! An example of what a real reply would be: "Peaches looks like her sister, not like Lady Gaga".